NEW LOW PRICE! 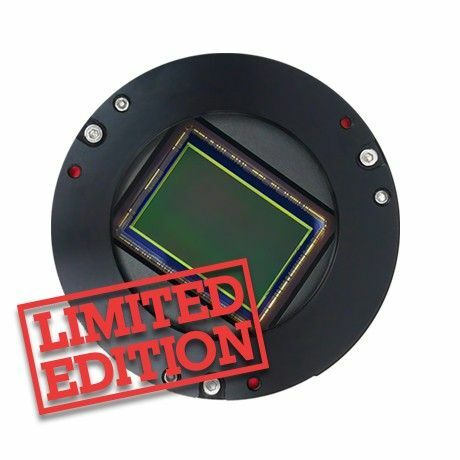 INCREDIBLE VALUE FOR A FULL FRAME SPECIALIST COOLED CAMERA! AVAILABLE FROM UK STOCK NOW! And these are their first full frame cameras that is a really exciting news. Both cameras have the same physical size, but because the pixel sizes are different, the overall resolution is also different, so the ASI094 is a 36MPixel camera whilst the ASI128 has 24MPixels...It doesn't mean that one is better than the other as it would depend only on the telescope's focal length which camera would be more suitable for your imaging setup. 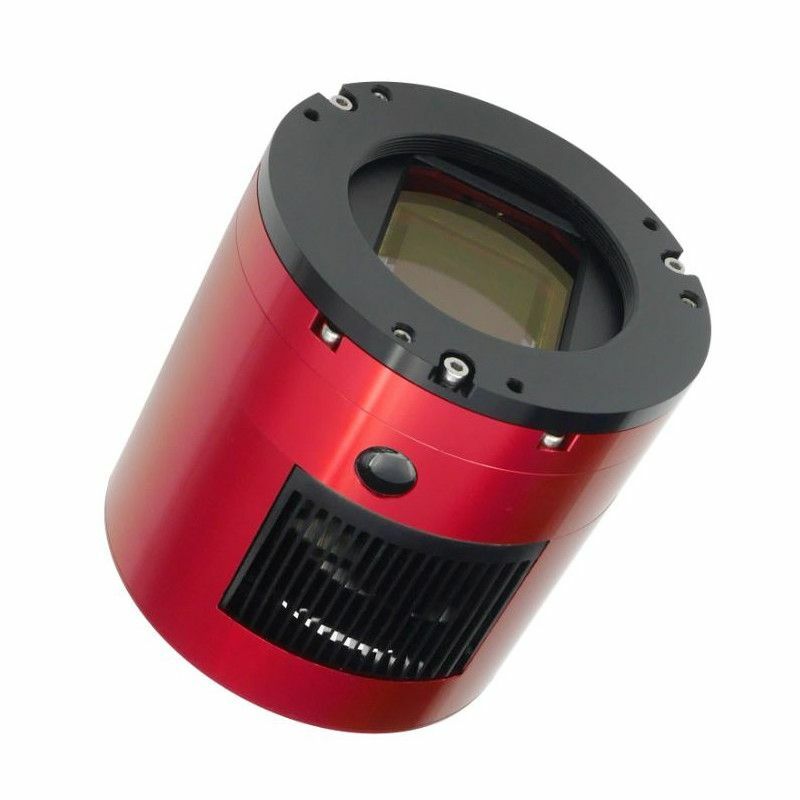 The ASI128MC Pro camera integrates a Sony IMX128 full-frame sensor (36 mm x 24 mm). It is a ZWO full-frame cooled colour camera. This camera features 6032 x 4032 pixels, and supports BIN2, BIN3 and BIN4 modes. The pixel size is 5.97 μm x 5.97 μm. This camera provides 14bit ADC and its full well is 76000e. With the ZWO ASI128 PRO you won't have to spend lots of time to get beautiful images, however if you need to tackle light pollution, you would also need a light pollution filter that we mentioned before. Due to the really large sensor, you would need to use a really large filter. Contact us if you are not sure what filter you need and how to attach it to this camera. Based on the features of this camera we would anticipate that it would be a very good choice for imaging large deep sky object for those who don't want to bother with filters, (other than a light pollution filter if necessary), plus with 5 frame per second frame rate it will most likely provide stunning views of the moon when used as a live view visual observation tool. (of course, it will also depend on the used telescope and seeing conditions). Bear in mind that the files would be also very large, so you'd need a PC or laptop with very good specs and large storage drive if you use it not just for long exposure deep sky imaging, i.e. high speed imaging or a video at 5 fps would produce a very large file in a short time. The key here is the DDR Memory Buffer. The ZWO ASI128 Pro camera includes one 256MB DDR3 memory buffer to help data transfer more stable and no amp-glow issue which is caused by the slow speed data transfer during reading out under USB2.0 Port. The DDR memory buffer is the main difference between ASI “Cool” and “Pro” cameras. The ASI128 Pro offers very good performance for astrophotography. Low read noise, high dynamic range, QE peak of 53%, AR protective window and much more. Compared with old full frame CCD such as KAI-11002, the IMX128 sensor has higher resolution, higher QE, lower read noise and faster FPS. 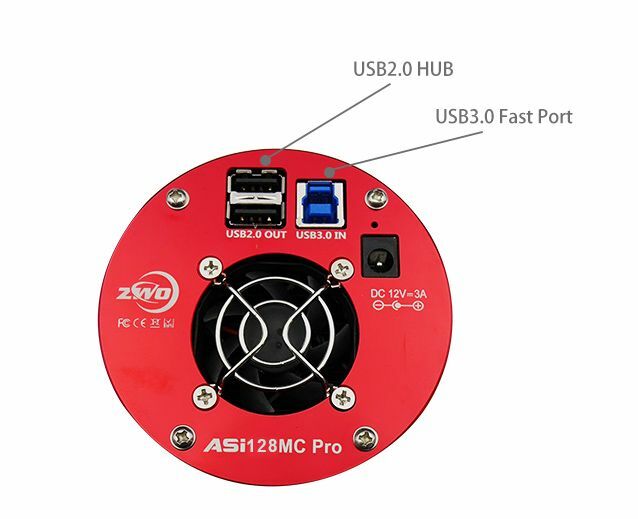 USB 3.0 Port: can provide 5Gb bandwidth to let ASI128 Pro run at 7 fps (14bit, normal mode) or 10 fps (10bit, high speed mode) at full resolution (24MegaPixels). We recommend to use a 12V at 3A or more DC PSU adapter to power the cooling system (2.1/5.5mm jack, center positive connection for the power supply). Battery from 9-15V is also suitable for cooler power supply. USB 2.0 HUB: can connect with various accessories, such as filter wheel, guide camera and electronic focuser, so you can manage your cables better with a USB2.0 hub. There are 2 short 0.5m USB2.0 cables with the ASI128 Pro. The power of hub source from external power supply if you connect it. The ASI128 Pro has got a 2 stage TEC cooling system to enable very deep cooling (-30-35℃ below ambient), but you need external power supply to power on the cooler. AC-DC power adapter is not included in this package, but available as an optional extra. This is the first ZWO ASI camera to come with a built-in anti-dew heater that can heat the protect window to avoid any internal or external dew problems. it povides a heat power of around 6W and can be turned off from the software to save power.